A failed state, in political and economic terms, denotes a process through which the boundaries of societal order and control recede, leaving the possibility of economic turmoil, infrastructural decline, and demographic shifts. Analogizing this process by way of the physical sciences (and by extension, to the visual realm of the natural world), a failed state is a descriptive term that acknowledges an erosion of physical boundaries, such as when an object through action, inaction, composition, or concept, does not adhere or cohere. In paintings, drawings, mixed media, and performance by Bent, Burton, Holoweski, and Shoshan, points are plotted but their positions are intermediate and destabilized, architectural forms that should act as natural physical barriers are illusory, figures dissolve and are hyperdigitized, and identity becomes mythic as personalities are confused and blur. Motifs of mechanization and superpositional geometries suggest mass displacement of populations, capital flight, and a distrust of modes of observation in contemporary culture. 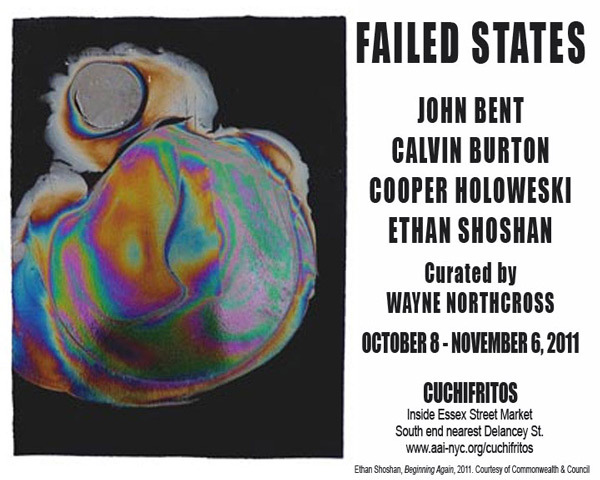 “Failed States” foreshadows matter as inchoate, perpetually on the cusp of decay and regeneration, and as multiversal, where materiality and existence are instable and irrational. Image Credit: Ethan Shoshan, Beginning Again, 2011. Courtesy of Commonwealth & Council.